Philippe Batoux and Michel Fauquet, a mountain guide and teacher at the National School of Ski and Mountaineering, will let you discover the role of a mountain guide through beautiful scenery, filmed in the mountains at the heart of the action. 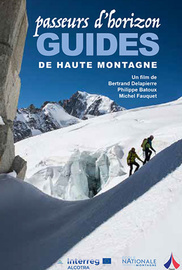 But also through the historian guide Claude Gardien and Bernard Prud'homme, guide and former director of the Chamonix tourist office. These two witnesses tell us about their vision of this professional activity through time and economic conditions while projecting into the future, without forgetting the climate change of our planet and its impact on the business. François Marsigny, in charge of the ENSA mountaineering department, describes the current training course for guides. The two filmmakers, supported by Bertrand Delapierre for editing and aerial images, followed their colleagues during one year between the Savoie and Val d'Aosta. You will discover the beautiful mountains of Lyskam, the Aiguille Verte, the granite and ice of the Mont Blanc massif and ski on the Brenva and Gebroulaz glaciers.